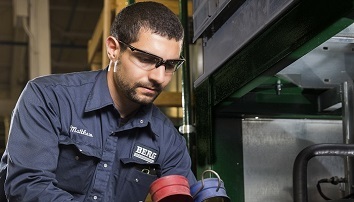 Water Quality Management for the Plastics Industry - Part 2 | Berg Chilling Systems Inc. 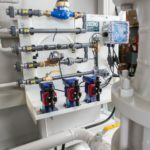 Learn How Process Water can Affect a Chilling System’s Performance, and Some Basics on How to Manage Industrial Water Systems. This is the second part of a series of articles on water and water management for the plastics industry. This article discusses the various sources for water systems, their properties and when and how to use each. We will also discuss some basic approaches towards managing some of the more common problems that are our plastics customers commonly experience. Water from these sources are moderately hard, approximately 120 – 140 ppm and have a pH of 7.6 – 7.8. Corrosion inhibitors are required for iron and copper, and scale inhibitors are necessary when used in cooling tower water systems. 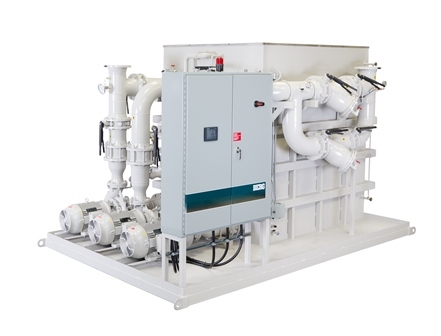 Treated water from these sources is ideal for closed water systems (chilled water) mold cooling applications and can be heated in extruder barrels or temperature control units without forming scale deposits. This water provides very economical make-up water for cooling tower systems. 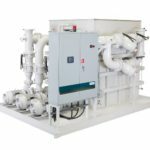 When properly treated cycles of concentrations can run up to 3 –4 making it very practical for cooling water cooled chillers, air compressors and hydraulic heat exchangers. However, at 3-4 cycles of concentrations scaling will occur when in contact with hot heat transfer surfaces. This is common in hot extruder screw and barrel heat exchangers and mold temperature control units. Chilled water (closed system water) is recommended for these applications. Hardness levels vary from 30 to 80 ppm, and pH levels of 7.2 to 7.6 are common. Like medium hardness water low hardness water is also ideal for closed water systems when treated with corrosion inhibitors, and scale formation will not occur when heated. In tower water systems low hardness make-up water allows for up to 6 cycles of concentrations making for even more economical use and reduced chemical costs than medium hardness waters. Low hardness tower water is less susceptible to scale formation when heated than medium hardness water, however chilled water (closed system water) is recommended for hot extruder screw and barrel heat exchangers and mold temperature control units. Well water is used when low or medium hardness water is unavailable. The high hardness makes well water only appropriate for closed water applications under the guidance of a water treatment specialist. Some well waters may also contain corrosive contaminants such as high levels of chlorides and sulphates, both of which can make even chemical treatment difficult. Well water can be used as tower water make-up but only with an aggressive chemical or chemical/softening programmes. Any well water application requires regular, daily testing and monitoring of equipment and chemical levels as per your water treatment company’s recommendations. Any equipment breakdown or chemical program upset will cause rapid scaling in all heat transfer equipment. The result – costly repairs and expensive downtime. Glycol is commonly used with water in chillers to provide freeze protection. The percentage of glycol depends on the coldest temperature that the glycol reaches during operation. In a chiller this temperature is normally the saturated suction temperature in the evaporator, and normally this temperature is 10°F below the chiller set point temperature. With this fact in mind, since water freezes at 32°F we only use glycol when the chiller set point is below 42°F, or if we are cooling a coil that is exposed to winter outside air. Some glycol products contain a corrosion inhibitor however glycol should not be used only for this purpose. Use corrosion inhibitors from a chemical company to supplement the glycol to be certain about preventing corrosion. Glycol is also a heat retardant rather than being good at transferring heat. Its presence also adds viscosity to the cooling fluid requiring higher hp pumps and higher flow rates to do the same as a pure water system. Therefore it is only to be used for freeze protection. There are generally two glycols that are used – propylene glycol, a food-grade and non-toxic glycol and ethylene glycol which although is toxic to humans and requires special handling and spill containment practices, is much less expensive and therefore more commonly used. Glycol at concentrations above 1-2% is toxic to bacteria. At low concentrations (0.1 – 1%) glycol is a nutrient for bacteria, and the by-product of the bacterial process is very acidic. Therefore, anytime you drain a glycol system you must do a thorough system flushing and immediately treat with a corrosion inhibitor. In some cases a chemical cleaning is a necessary part of the flushing to ensure that you have completely removed all traces of glycol. Please consult your water treatment company. For most types of plastics the molds require cool water temperatures to minimize part cycle times and maximize productivity. Since the required temperatures for these molds cannot be reliably maintained with cooling towers during warm weather, and since the mold passages are small and easily fouled most plastics plants dedicate a chiller to the molds and plastic processing sections of extruders and use tower water for the shell and tube heat exchangers for hydraulic cooling, chiller condensers, air compressors, extruder feed throats and gear boxes. The exchangers in this equipment are usually shell and tube that are easily acid washed if cleaning is necessary. The spaces between the tubes are more forgiving to fouling than the small 1/16″ spaces found in plate and frame exchangers and in small mold passages. Double Y Strainer for large particle filtration provides protection to water circulation equipment against plugged strainers and filters with no downtime. 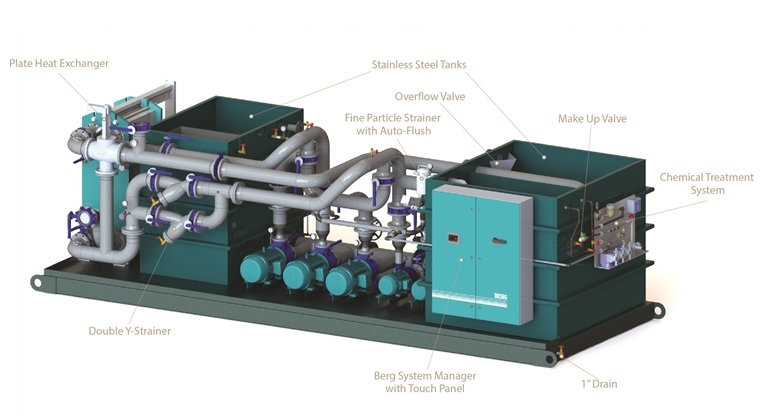 Smart plant water system design uses mechanical (chiller) cooling only as needed, and maximizes the energy savings found when using water cooled equipment whenever possible. Tower water (ambient) cooling costs a fraction of the operating expense of a chiller, and a fraction of the equipment capital cost on a $ per ton basis. For this reason many plants select water-cooled chillers, air compressors and air dryers to put onto a cooling tower and dedicate a chiller for only cool water applications. 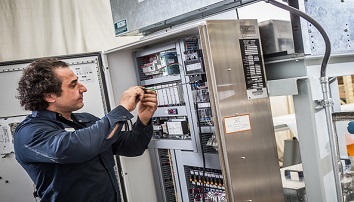 There are other cases where tower water is a good choice for temperature control units, barrel and screw cooling. The required temperature set points for these may be between 140 – 180°F and as we discussed in the previous article the high concentration of calcium in the tower water will cause scale formation where tower water directly contacts the heaters and hot heat exchange surfaces. Precipitated scale will also migrate downstream to foul molds and other process equipment. If your plant has medium hard make-up plant water, or if only very clean water can be tolerated in your molds and processing equipment, and your exchangers can be adequately cooled with tower water there are solutions available if you do not have a spare chiller available. Stainless Steel Fine Particle Strainer with Auto-Flush captures sediment in the clean process water. 1) Softening: Softening uses a sodium zeolite resin that can be regenerated by brine to remove all calcium hardness from the make-up water. This will eliminate any hardness scale formation when the tower water contacts hot heat transfer surfaces, however the softened water changes its balance from being scaling water to corrosive water. The solution is to install a small valved by-pass around the softener and maintain just enough hardness in the water (approximately 80-100 ppm) to remove the corrosiveness and low enough in concentration to not precipitate when heated. This is a relatively low cost solution however be cautioned that thorough monitoring by the plant on a daily basis must be performed in order to correct any softener upsets, maintain the salt brine tank and balance the blend between the hard, by-pass make-up water with the 100% softened make-up water. Failure at any time can result in totally scaling up your system. 2) Clean Water Tower Systems: Safe, reliable and worry-free plant operation can be assured by converting your tower system to a Clean Water Tower System. Here an efficient plate and frame exchanger is installed in the tower system with standard 85°F/95°F water providing the cooling on one side of the exchanger and a closed loop process water system operates on the other side. The process equipment sees a minor increase in temperature (most exchangers can be sized to a 3 – 5°F difference between the inlet tower water temperature and the outlet process water temperature), and the cooling water system becomes a standard closed loop system that can tolerate high hardness without scaling. The difference between this water and tower water from the same source is that there will be no make-up to replenish the scaling process, the hardness level is a fraction of the tower water hardness, there is no contact with the air so there is none of the particulate present to cause fouling or deposition, and the water treatment is a simple, add as required process assuming that the system stays tight (apart from periodic mold changes). A large system with two separate tanks is shown below. Tank baffles are not required but were added in this application to provide extra strength to the two large tanks. 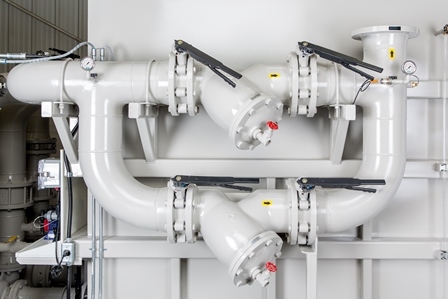 In small applications less than 150 tons the two tanks can be brought together with only three pumps necessary (one process pump, one tower pump and one standby pump). In other cases, if the tower tank is large enough, or if it can be modified a heat exchanger can be added to the tankset and the baffled tower tank can be converted to two separate tanks with a full baffle from the bottom to the top of the tank. 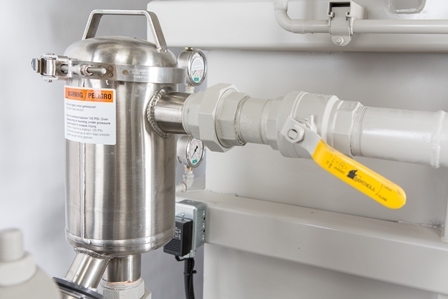 Some additional valves and piping changes then can retain the operation of a standby pump and use the two tanks to create a Clean Water Tower Tankset. Berg Clean Water Tower System ensures safe, reliable, worry-free operation. 3) Other Solutions: Reverse osmosis, deionized water processes and other forms of water conditioning can remove hardness and other unwanted contaminants. There is usually a high cost to buy, install, and operate this equipment. Some of you may also encounter the non-chemical devices that claim to eliminate all chemical treatment, remove existing scale, and run without the need to do daily plant tests. Many come with testimonials and references that are hard to trace, and may sound very convincing. It has been the author’s experience that when things sound too good to be true they probably are, and we urge caution and consultation before you decide to try. 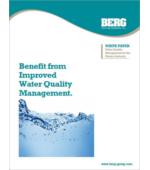 We hope that these two articles provide a basic understanding of water quality management. We cannot understate the importance of working together with a reputable and high quality water treatment company representative to enable you to achieve your goal of maximum productivity, long equipment life and efficient plant equipment operating expense. 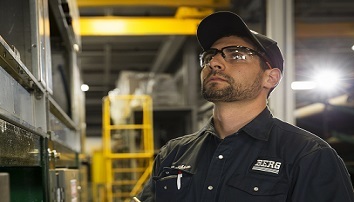 See Berg’s Full Line of Process Water Solutions.